These are my 7 gallon-size jars, which I keep in rotation to brew us a continuous supply of Kombucha. The photo reveals various stages. The three jars furthest to the left are the most mature. The mushroom is floating at the top and you can see the youngest parts (the lighter, almost white colored) growing at the top of the floating mushroom. The next two jars to the right were just filled with fresh tea, and you can see that their mushrooms hadn’t yet risen to the surface. Finally, the two jars on the far right are empty except for a bit of mature tea and the scobys (recommended source) — they are waiting for new tea to fill them. 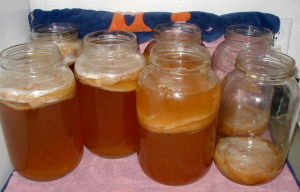 To my Kombucha recipe which I posted the other day, I added the above picture. I also added the stipulation to use raw, organic agave or raw, organic honey. In case you printed it out and were ready to go ahead, I would not want you to miss this step. I am sorry about the mistake and any inconvenience it caused you.